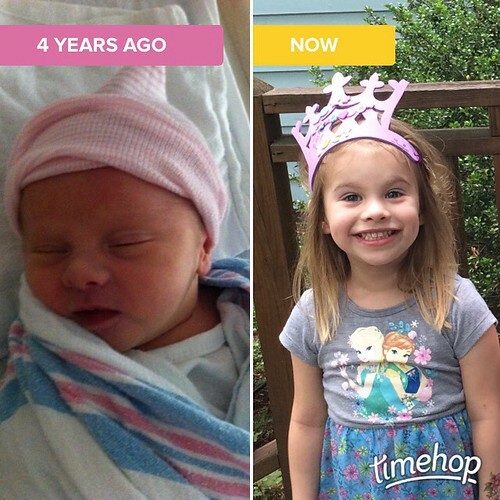 Yesterday, Lucy turned 4 years old. 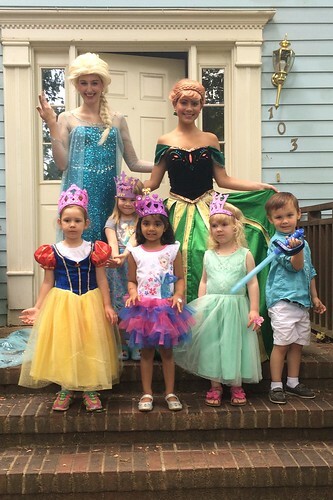 There’s a local company where you can hire any of the Disney princesses to come to your child’s birthday party – I get the impression that they’re mostly college girls with licensed Disney costumes – so we had Elsa and Anna come to Lucy’s party. 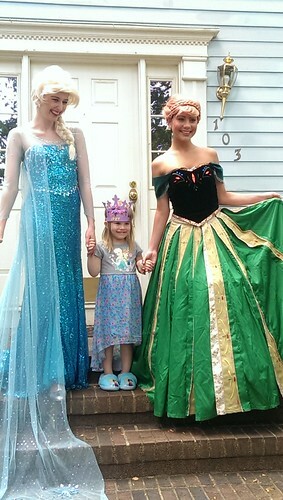 And I have to say, if you have a princess-obsessed little girl, and you have the opportunity to hire a “professional” princess for your kid’s birthday party: DO IT. The princesses were great, they have a whole little agenda for birthday parties: they had story time, they had a little arts & crafts project, Elsa put eye shadow & little sparkles on all the girls, Anna painted their nails, we went outside so they could get “sprinkled with pixie dust” (which I’m 99% sure was glitter hair spray), and then we sang happy birthday and had cake. It was so fun. 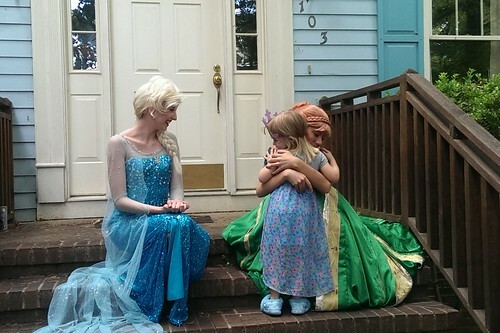 Lucy keeps asking how far a drive it is to Arendelle, and when Elsa and Anna can come to our house again. Best group picture I could get. They’re only 4, you can’t expect too much. The 3 little girls who came to the party were TOTALLY on board with the princess thing; the one little boy there wasn’t into it at all, and he mostly hung out with Catie and they had play swordfights. 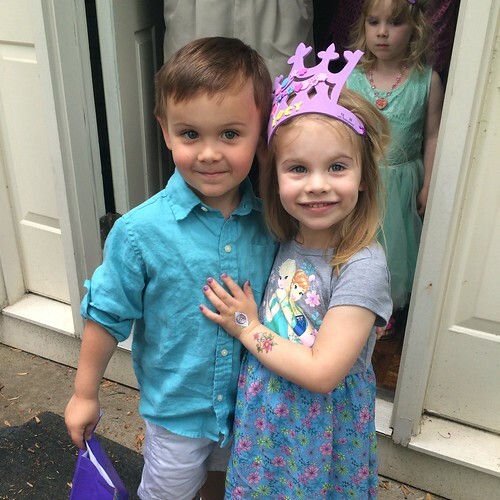 Although it’s funny that he was the only boy Lucy wanted to invite – she calls him “boy Jackson” because there are 2 kids at her daycare named Jackson, one is a boy and one is a girl. (The girl is, obviously, “girl Jackson.”) They’ve been in the same class since they were 2, and they adore each other. As Jackson was leaving the party, I asked him and Lucy to smile for a picture for me. They automatically put their arms around each other and Lucy put her hand on his chest, and I swear this is the pose of every senior prom portrait ever taken. Totally saving this for their wedding slideshow someday. The weekend was also great because my sister flew in, and my brother and his girlfriend drove over from Charlotte for the weekend. (My brother and his girlfriend just recently adopted both a puppy and a kitten, and brought both along. Catie went nuts over them; Lucy was pretty much indifferent – if it isn’t a baby or a princess, it doesn’t hold her interest.) It was fun to get to visit with them, and the girls love having them around. 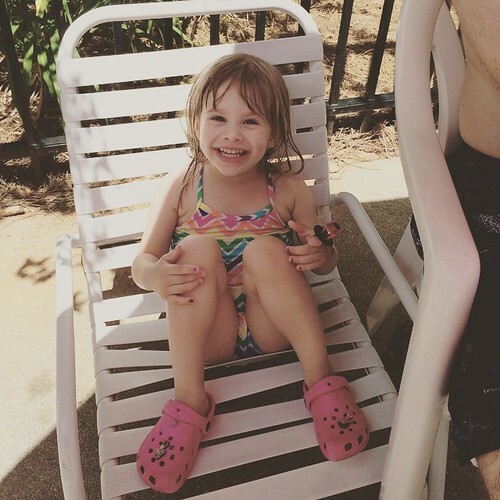 Sunday was Lucy’s actual birthday, and since we did the party on Saturday, and my siblings went back home on Sunday morning, we spent the afternoon at the pool with my cousin and her kids. Lucy didn’t seem to have any complaints. A couple of years ago, when Lucy was two, I remember saying that I wanted a fast-forward button so I could skip ages 2 and 3. The toddler tantrum years are my least favorite, potty-training is the WORST, and I just wanted to skip ahead to 4. Four is so fun! And what do you know, we finally made it here at last. Happy birthday, Lucy Goose. You are a ball of pure comedy, joy, and delight, and I couldn’t be happier to be your mama.